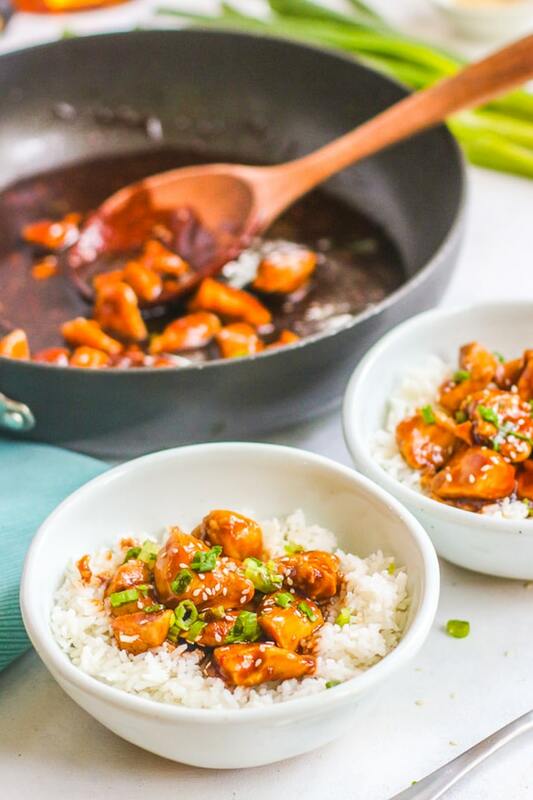 This Spicy Bourbon Chicken is an easy and flavorful dish that’s perfect for weeknight meals! It’s easy to spice it how you’d like so it fits your family. Hi, all! 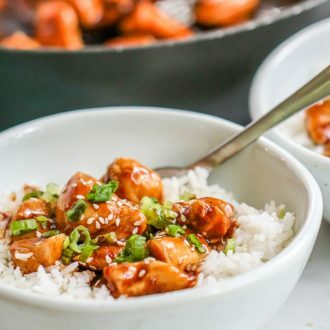 I’m Sam from The Culinary Compass and I’m so excited to be able to bring you this Spicy Bourbon Chicken recipe! The sauce is so simple but so flavorful. It all comes together in less than 30 minutes which makes it the perfect weeknight meal! The Spicy Bourbon sauce is layered and full of flavors that tie in to create a great sticky sauce that’s sure to please. It’s got a salty base from the soy sauce that balances well with the deep flavors of the bourbon. 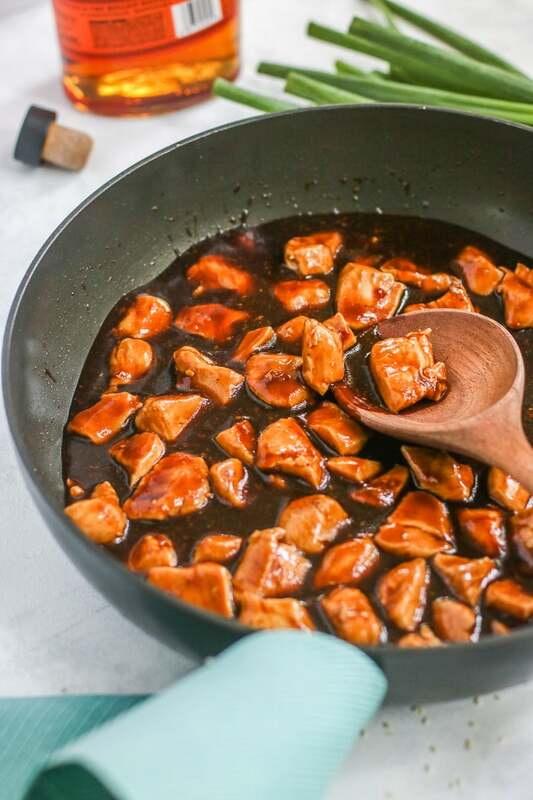 My favorite part is the caramelization of the brown sugar that bubbles together and creates a richness in the sauce. Just be sure to let the bourbon cook off to ensure a smooth tasting sauce! It’s easy to adjust the spice level too which makes it perfect for all families! I use sambal oelek to bring the heat! It’s traditionally found in Asian cuisine and it’s become a staple in my pantry. It’s made out of chilies, garlic, and spices that I personally think is even better than sriracha. 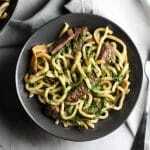 This is the perfect dish to try it out on! I used one tablespoon and let it simmer which was enough to bring some heat. 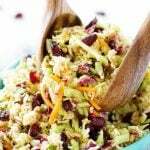 If you like spicy, up it to two tablespoons or just drizzle some on top of your dish! If you aren’t too sure about the spice, try half a tablespoon to bring in the flavors into the sauce without too much kick. To make it a quick meal, I just serve it on rice with some sesame seeds and green onions. 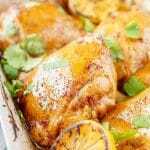 It’s quickly become a family favorite just for the simplicity and bold flavors that come from it! 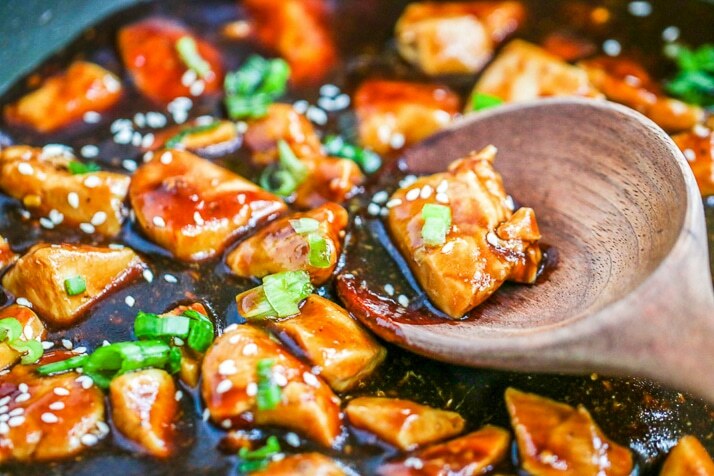 More Easy Asian Inspired Dinners! In a large saute pan, heat olive oil over medium-high heat. Add chicken breast and season with salt and pepper. Heat until no longer pink, about 8-10 minutes. Use a slotted spoon to remove from pan. 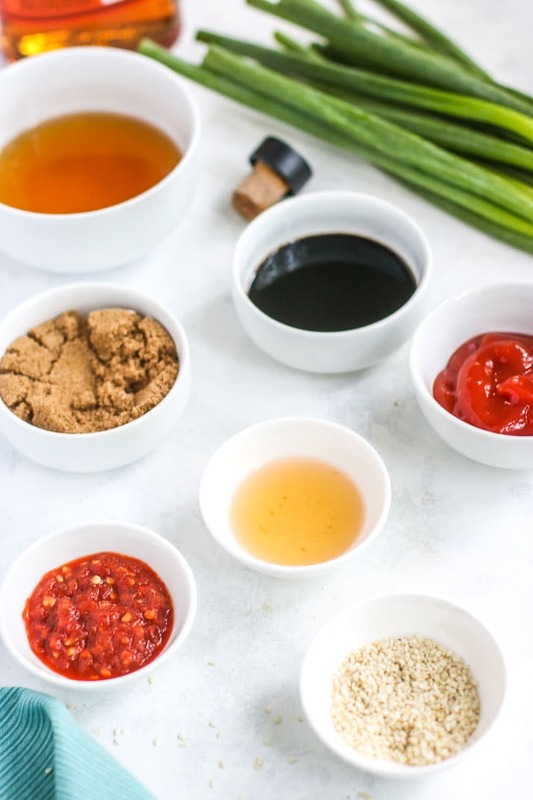 In a small bowl, mix sambal oelek, soy sauce, ketchup, apple cider vinegar, brown sugar, bourbon, and 1/4 cup water. Pour into saute pan and let simmer for 5 minutes. In a small bowl, mix together 2 tablespoons of water and corn starch until smooth. Pour into bourbon mixture and mix. Let simmer until thickened, 2-3 minutes. Add in chicken and toss to coat. Let simmer 5 minutes. Serve warm. 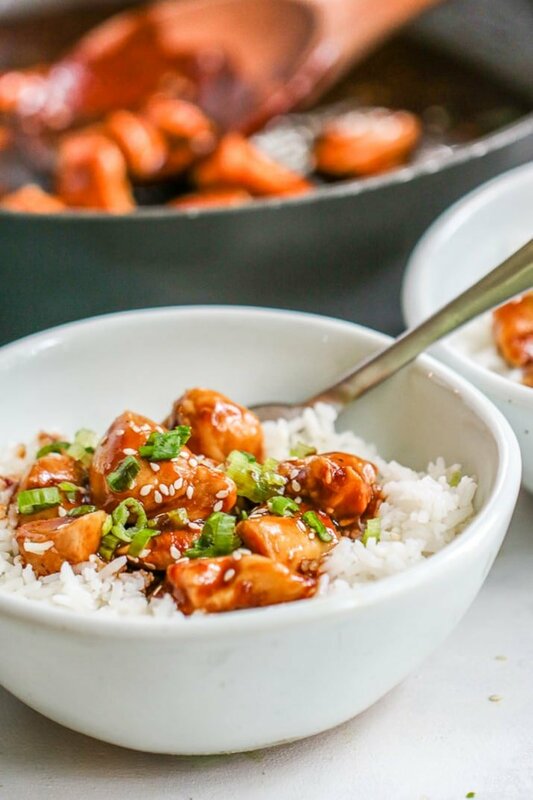 Pin this Bourbon Chicken for Later! Hi Sam from Culinary Compass! What a fun and easy recipe! 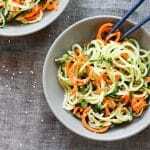 Gotta love meals that take only 30 minutes to make (and are deliciously spicy to boot).